Solitary Reticulohistiocytoma (SRH) of the skin [1,2] is a benign mesenchymal tumor with histiocytic proliferation of unkown etiology, belonging to reticulohistiocytosis (RH) [3,4]. In contrast to multicentic reticulohistiocytosis (MRH) [1,3,5], the other clinical setting of RH, SRH has no associations with arthritis or systemic lesions. It usually presents an asymptomaic papule or nodule, often sited on the trunk, although any site may be affected. Different from the necessity of systemic therapy for the challenging clinical process of MRH [6,7], the only curative therapy for SRH is surgical removal, or it may even regress over the course on observation. On the other hand, however, it often needs to be distinguished from so many skin tumors including some kind of malignancies [2,3,8]. Among such differential diagnosis, the most important problem is its discrimination from melanoma in view of the unfavorable prognosis for the latter. Here we report a case of SRH mimicking clinical appearance of amelanotic melanoma. A 29-year-old male visited our outpatient office presenting a surface-eroded nodule 7 mm in diameter on his rt. lateral abdomen (Figure 1). He was otherwise healthy. He had had that lesion for 2 month before his visit. Relatively rapid growth of the tumor and its peculiar appearance at the gross level led us to raise amelanotic malignant melanoma as the diagnostic possibility. The pathlogical findings of hematoxylin and eosin stained sections of the excisional biopsy revealed large hematoma just beneath the epidermis, and circumscribed dermal nodule (Figure 2). The nodular lesion was composed of multinucleate epitheloid giant cells with an eosinophilic, glassy appearance-cytoplasm, histiocytes and inflammatory cells mainly by neutrophilic infiltrate (Figure 3). Additional findings include scattered xanthomatized cells. These were histologically pathognomonic characteristics of reticulohistiocytoma. Immunohistochemistry exhibited that such massive distribution of epitheloid histiocytes were immunoreactive for anti-CD68 antibody, in contrast to the negative stains for S-100, HMB-45 and melan-A, allowing distinction from malignant melanoma (Figure 4). Our patient has been disease-free for a year. 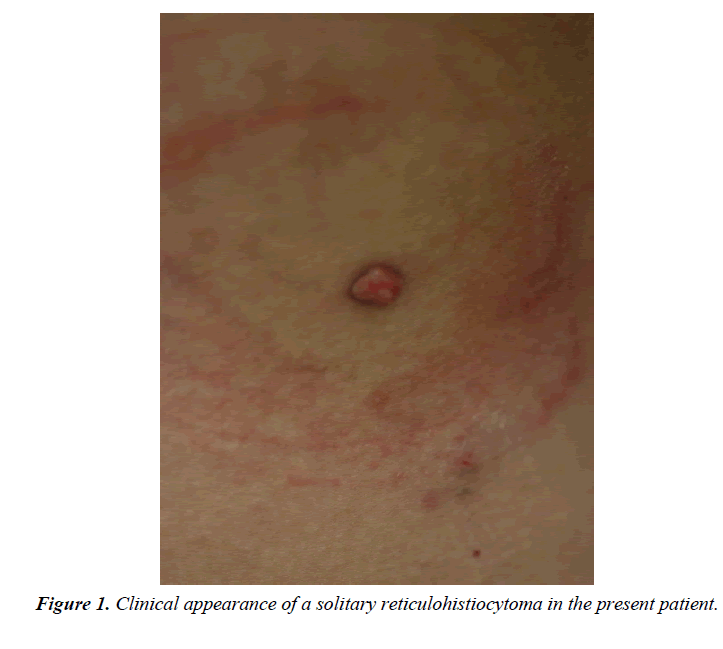 An asymptomatic skin nodule of subtle appearance should prompt consideration of reticulohistiocytoma in the differential diagnosis. Figure 1: Clinical appearance of a solitary reticulohistiocytoma in the present patient. 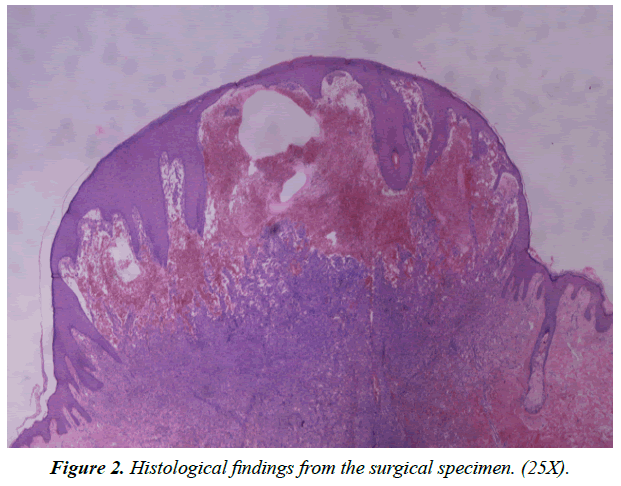 Figure 2: Histological findings from the surgical specimen. (25X). Figure 3: Characterisic intralesional multinucleate giant cells, histiocytes and inflammatory cells. (200X). 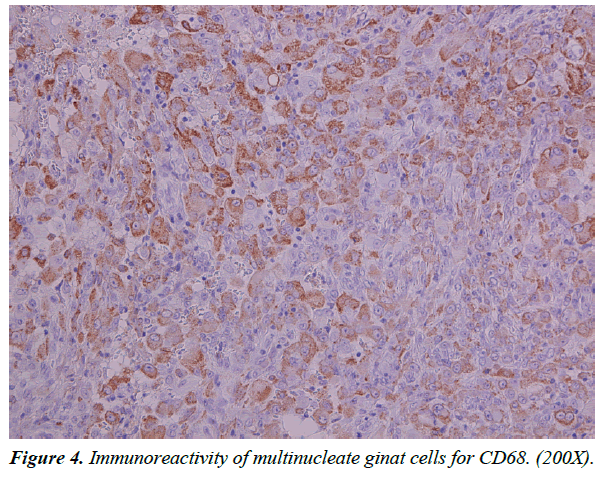 Figure 4: Immunoreactivity of multinucleate ginat cells for CD68. (200X). Zak FG. Reticulohistiocytoma (ganglioneuroma of the skin). Br J Dermatol. 1950;62:351-5. Miettinen M, Fetsch JF. Reticulohistiocytoma (solitary epithelioid histiocytoma): A clinicopathologic and immunohistochemical study of 44 cases. Am J Surg Pathol. 2006;30(4):521-8. Zelger B, Cerio R, Soyer HP, et al. Reticulohistiocytoma and multicentric reticulohistiocytosis. Am J Dermatopatol. 1994;16:577-84. Favara BE, Feller AC, Pauli M, et al. Contemporary classification of histiocytic disorders. The WHO committee on histiocytic/reticulum cell proliferations. Reclassification working group of the histiocyte society. Med Pediatr Oncol. 1997;29:157-66. Oliver GF, Umbert I, Winkelmann RK, et al. Reticulohistiocytoma cutis-review of 15 cases and an association with unusual immunophenotype. Clin Exp Dermatol. 1990;15:1-6. Macia-Villa CC, Zea-Mendoza A. Multicentric reticulohistiocytosis: Case report with response to infliximab and review of treatment options. Clin Rheumatol. 2016;35:527-34. Motegi S, Yonemoto Y, Yanagisawa S, et al. Successful treatment of multicentric reticulohistiocytosis with adalimumab, prednisolone and methotrexate. Acta Derm Venereol. 2016;96:124-5. Gulec AT. Solitary reticulohistiocytoma with arborizing vessels: A new mimicker of basal cell carcinoma. J Am Acad Dermatol. 2016;74: e5-6.